-----Most of us remember the past with nostalgia. The sound of a steam whistle, the scent of steam mixed with coal smoke, the trilling of a calliope - all conjur idyllic images from former years. On deeper reflection, we know we are creating a myth. We ignore exploding boilers, hellish conditions for crew, greed, and malevolent personas sacrificing crew, passengers, and vessel to satisfy ego. -----Memories are selective. We prefer to focus on the joys of the past - we celebrate the myth, but remember the cost. 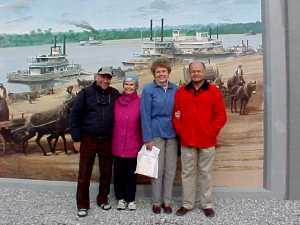 -----For over one hundred years, flatboats and keelboats had landed at the riverbank in Paducah. 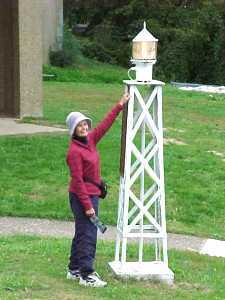 Human energy, combined or opposing the river current, moved pioneers and commerce along the Ohio. Suddenly, the invention of steam power changed everything. Only eighty years before the photograph of El and Bill (Halcyon) and Marge and Tom (Pelican), the scene on the river bank was completely changed and life along the river would never be the same. -----Human history may be divided into great eras, each begun by a simple revolution that would change everything. When a human discovered that plants and animals could be domesticated, tended, and grown, it was the end of hunting and gathering. The Agricultural Revolution allowed humans to become sedentary, giving enough free time for the development of a very different culture. The invention of a steam engine changed the way humans work - suddenly animal and human muscle no longer powered the way we did things. It was the Industrial Revolution, and human culture again made a vast change. This revolution was followed by modifications: the invention of electricity, the internal combustion engine, the splitting of atoms. But, these variations primarily changed the way work is done. Now, perhaps, we are living through another great change - the Information Revolution. We are changing the way we think. The words you are reading were written on a computer and are stored in cyberspace - that is a great change from a mere fifty years ago. -----Revolutions begin with a single shot, and the enormity of that event is rarely appreciated at the time. Around the end of the 17th Century, tinkerers were toying with steam power. The force of steam exiting a kettle had long been observed, but how could this energy be harnessed for useful work? Of the many experimenters making steam engines, one got it right. In 1769, a Scott, James Watt, patented his idea. -----All designs for steam engines at the time used boiling water. Boiling to steam expands water to 1,670 times its original volume. When the steam pressure reaches 225 lbs/sq in, steam is released into an engine where it drives a piston. Now, the genius of Watt enters the picture. He designed a condenser to capture the steam leaving the engine. Cold water flowing over the tubes containing steam condensed the steam back to water. Now the reverse of boiling occurs, and the water contracts, making a vacuum. He designed his engine so the contraction pulled out the steam leaving the engine. Thus, on one side of the piston, steam pushes - on the other side, vacuum pulls. This gives much more power than just steam alone. A simple concept - a single shot - and the Revolution began. Life on Earth would never be the same. -----Steam engines were soon adapted to virtually every conceivable aspect of human life - making clothes, sawing wood, moving a plow … everything. So it wasn't long before many inventors were designing a steamboat. In America, John Fitch made the first successful trial of his design. He launched a forty-five foot boat on the Delaware River, in 1787, watched by members of the Constitutional Convention meeting in Philadelphia. His boat was a success and he soon launched a larger steamboat to carry passengers and freight on the Delaware River. Fitch was granted a patent by the new United States, although there was a dispute with James Rumsey of West Virginia, who invented the same design. 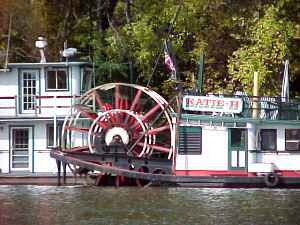 Fitch eventually built four different steamboats, using paddles all in a row (like Indians canoeing), paddle wheels, and screw propellers. His boats were mechanically successful, but he was not a businessman. His construction and operating costs were too high, and his boats were not commercially successful. -----Robert Fulton, in partnership with Robert R. Livingston, built the Clermont in New York. In August 1807, his vessel cruised the Hudson River from New York City to Albany, at an average speed of about five miles per hour upstream. He soon turned the steamboat into a commercial success. 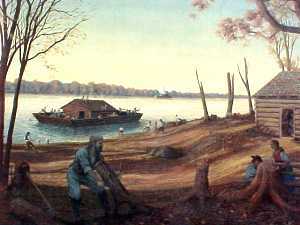 -----In 1811, Fulton and Livingston built the New Orleans in Pittsburgh and launched it into the Monongahela River. It had a flat-bottomed hull for the shallow western rivers. That year and the next, the largest earthquakes recorded in America rocked the Mississippi and Ohio River Valleys. The New Madrid quakes were many times greater than the San Francisco quake, a century later. Parts of the Mississippi Valley sunk, forming Reelfoot Lake. Church bells in Boston rang from the shaking. The New Orleans blithely chugged southerly to New Orleans through the channels and lakes formed by the New Madrid quakes. This new steamboat earned $24,000 in its first year of service. By 1814, Robert Fulton and Edward Livingston, brother of Robert, offered regular passenger and freight service between New Orleans and Natchez, Mississippi. That year saw twenty steamboat arrivals in New Orleans. In 1816, Henry Shreve's Washington cruised from New Orleans to Louisville in 25 days. He named the passenger cabins on the Washington after states, hence the name staterooms. -----It was not without cost in human lives. There were many steamboat tragedies, most unrecorded and forgotten. Individuals scalded to death, workmen fell overboard, cargo shifted crushing stevedores, and fires raged aboard - all took their toll. The major accidents are remembered. In 1837, the steamboat Monmouth collided with the ship Tremont on the Mississippi River and 400 Cree Indian passengers died. Two years later, the Moselle exploded near Cincinnati killing almost 150 people. The worst steamboat disaster occurred in 1865. The Sultana, designed to carry 376 passengers was crammed with 2,400 Union soldiers - most were survivors of southern prisoner-of-war camps. 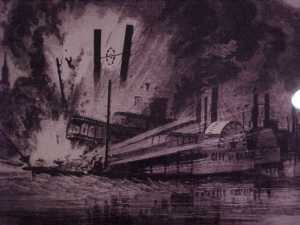 At night, just north of Memphis, the Sultana exploded killing some 1,650. This was a toll never exceeded on the America's rivers and rarely at sea. It is remembered each April in Knoxville TN by friends and descendants of the Sultana disaster. But that catastrophe was not the last. On April 27, 1865, there was a collision between two steamboats, the America and United States, near Warsaw Ohio - fuel oil caught fire burning both ships and turning the river into fire - perhaps 150 died. A few years later the Magnolia burned on the Ohio River, and in 1882, the Scioto collided with the John Lomas and 57 died. -----Despite the losses, steamboats swarmed on the rivers. 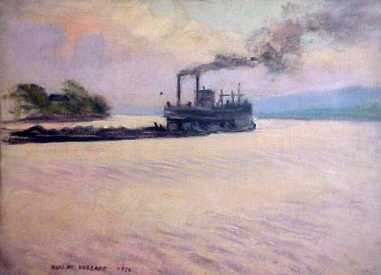 Steamboat traffic on the Ohio and Miss exceeded that of the east coast. 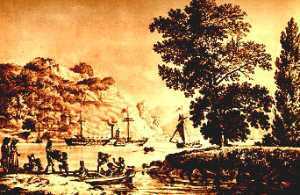 By 1825, there were more than 700 steamboats on the Ohio River. In 1834, 1,200 steamboats made arrivals in New Orleans. 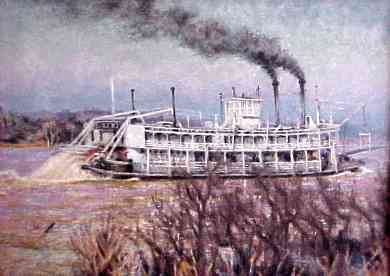 In 1848 there were more than 4,000 steamboats on the Ohio. Not only numbers increased, but hull and engine design improved, such that in 1853, the trip from New Orleans to Louisville was reduced to four and one-half days. -----Coal was abundant in Pennsylvania, so the price of wood was twice as expensive as coal in Pittsburg in 1828. But, due to high freight rates, coal was too costly on the lower Ohio and Mississippi. Boilers were fired by wood in the lower reaches, and boats stopped often for resupply. The first steamboat, New Orleans, burned coal for the northern part of its trip. Coal came into general use on all the rivers just before the Civil War. 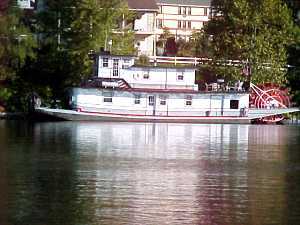 -----The Heyday of steamboats on the rivers was between 1845-1865. Steam engines on railroads quickly eclipsed steamboats, and in just a few decades, most were gone. The throaty wail of steam whistle no longer echoed off the far hills. The steam calliope, with its whoops and whistles, is now a vestigial trace of the past. The Steamboat era is gone. 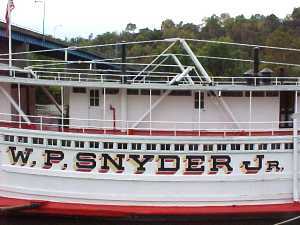 Halcyon meets W. P. Snyder, Jr.
-----The W. P. Snyder is a paddlewheeler lovingly restored by volunteers. 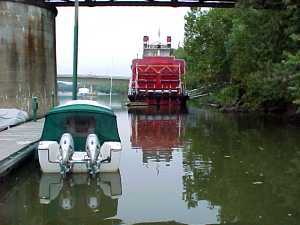 She is docked in the Muskingum River at Marietta, OH. 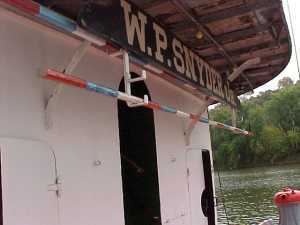 We took a tour through the Snyder and it gave us an "inside" view of a paddleboat. 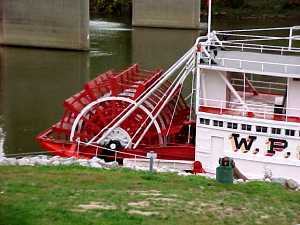 Her paddle wheel was most impressive in size and number of paddles, and her boilers massive. 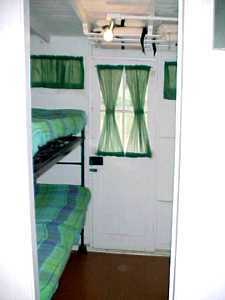 -----Her staterooms were small, and all had two doors -- one into the hall and the other to the outside. This gave two avenues of escape in case of fire. 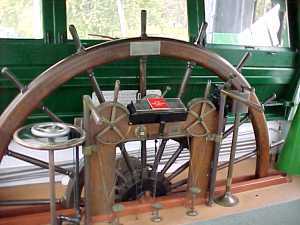 Her pilot house was equipped with two types of steering - she had a wheel or steering levers, like modern day tugs. 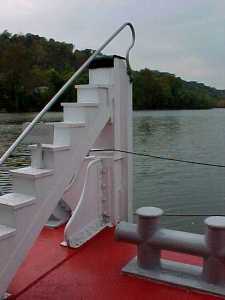 Her knees had steps to gain easy access to barges being pushed, and all her equipment (and crew) were beautiful. Her pole for sounding depths was handy to the bow. 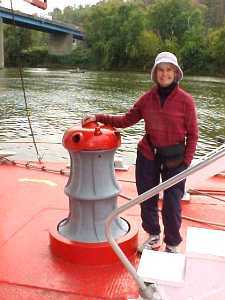 -----It was early discovered in the construction of steamboats, that the heavy weight of boilers and engines, mounted roughly midship, could break the back of the boat (Fluton had this experience in one of his first boats, much to his dismay). 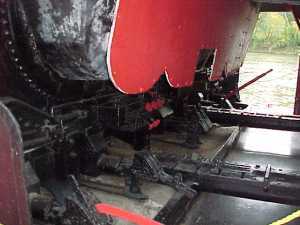 Consequently, most steamboats were reinforced with strong steel cables running above the top deck. These could be tightened or loosened as necessary to keep the hull flat in the water. 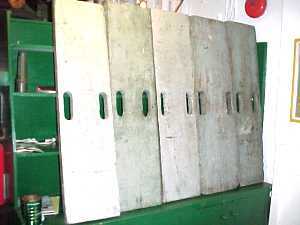 -----We were perplexed by the boards with two elliptical holes in them, stored below decks in the boiler room, where they would be readily accessible to the crew. They are the "life jeckets," primitive p.f.d.'s. -----There are those who keep the spirit of the past alive. Lets share a few of those views from along the Ohio.